Do you like our new table? It’s the one in these photos. Rough dark-brown pine, full of knots and flaws. We especially chose something a little on the rustic side, where a few spills and knocks will only add character. Because we’ve got two little kids, and while we don’t want them to trash the house, exactly, we’re never going to be the kind of family that keeps the kids away from the furniture. We’re simply not that precious. And besides, in the end we won’t love the table because it looks good. I mean I like things around the house to look good – I’m not immune to the simple pleasures of aesthetic beauty – but in the end we’ll love it because it will become imbued with our memories, our stories. We’ll sit at that table every night, all four of us, eating good food, talking about our day, aggravating one another and making each other laugh. Over time the narrative of our family will be deep in its cracks and its crevices. These days, dinner at our new table is a kind of organised chaos. W is intent on having T’s highchair pushed close up to her chair while we eat so she can help feed him. This is both heartache-ingly adorable, and totally annoying. Adorable because how can we not resist our toddler wanting to be close to her little brother, to help him and to share her food with him. Annoying because despite her good intentions she inevitably pokes him or takes his spoon when he’s still using it, or tries to stuff food down his throat, and tears ensue. So we calm him down, sit her back in her chair, and repeat. Though I sometimes (oftentimes) long to sit and finish an entire meal without these constant interruptions, I wouldn’t exchange it for the world. And so go our days. 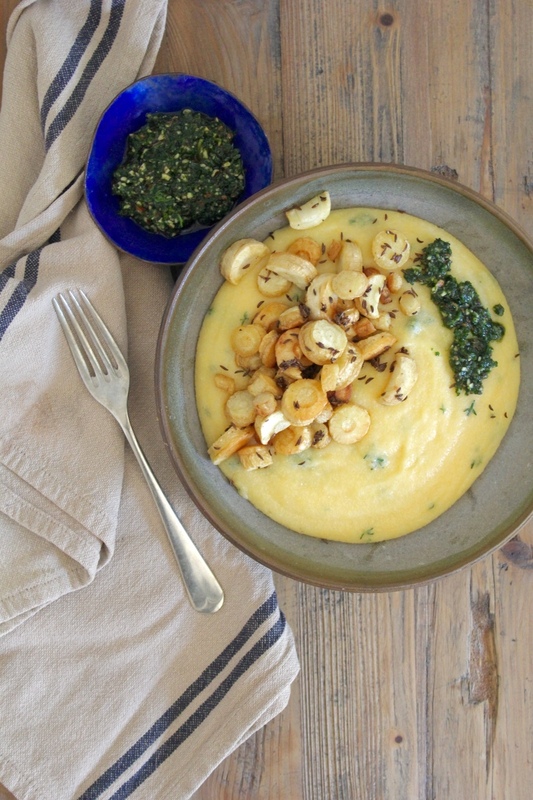 Although the cooler weather has long since deserted us here in Brisbane, I’m sharing a decidedly autumn-like dish. I made this a few weeks ago, during the last of the cooler days. 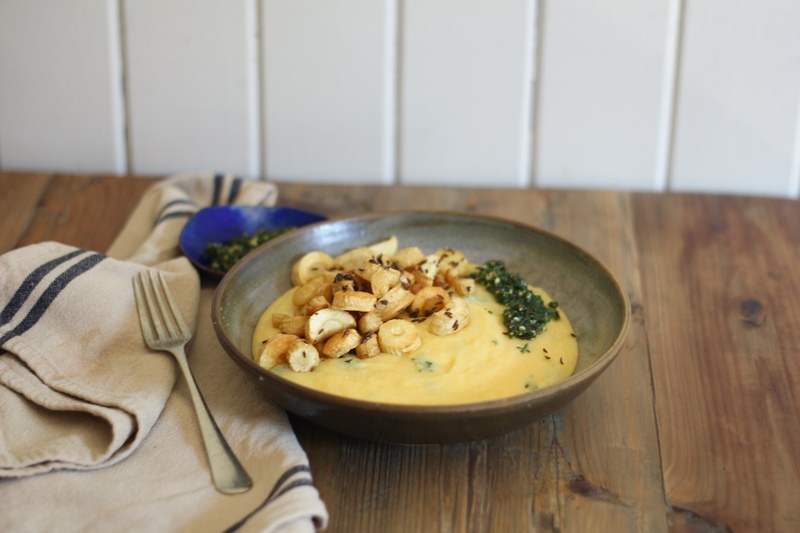 It is an incredibly comforting meal. 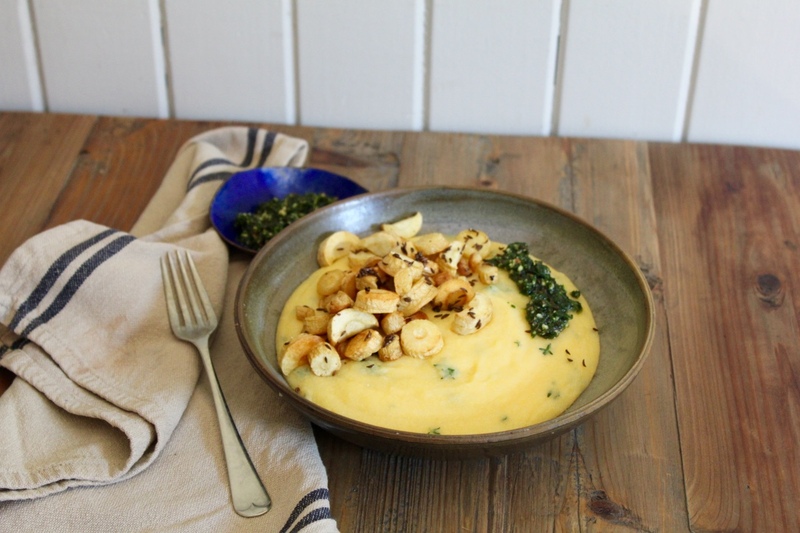 Rich, creamy polenta, buttered parsnips, and a hint of pesto to bring a nutty herbaceous note. Truth time? This is a dish for two, but I ate the whole lot by myself for lunch, sitting cross-legged right on top of our brand new table. And I’d do it again. Pre-heat oven to 200° celsius/400° fahrenheit. Top and tail the parsnips and cut into discs, halving the circles into half-moons if they’re too big. Put the tablespoon of butter into a small baking dish and pop it into the hot oven for a minute or two, just to melt the butter. Add the parsnips to the dish and toss to coat in the butter. Lay in a single layer and sprinkle with the caraway seeds and salt & pepper, to taste. Roast for approx. 35 mins., or until the parsnips start to brown. To make the pesto, combine all of the ingredients in the bowl of your food processor and mix until fully combined (I like mine a little chunkier, but process until it reaches your preferred consistency). 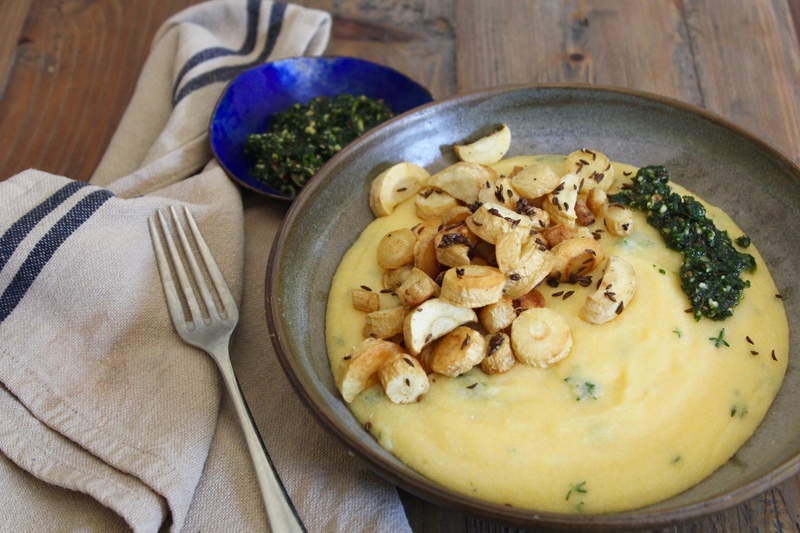 While the parsnips are roasting, make your polenta. In a large, heavy-bottomed pot over a medium heat, heat up the stock. When it is almost at a boil, slowly pour in the polenta, whisking all the whole to avoid clumping. Turn the heat down low, add a generous pinch of salt, and cook for approx. 30 minutes, stirring regularly with a wooden spoon to avoid clumping or sticking. 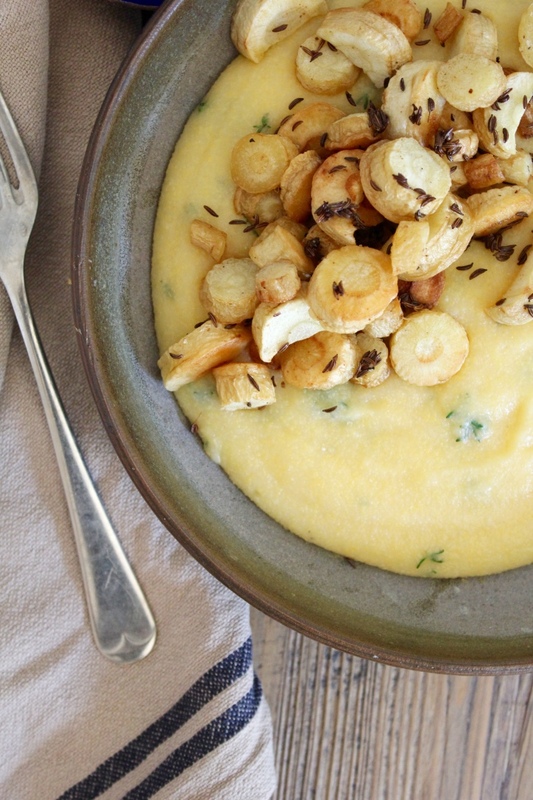 The polenta should be nice and thick. 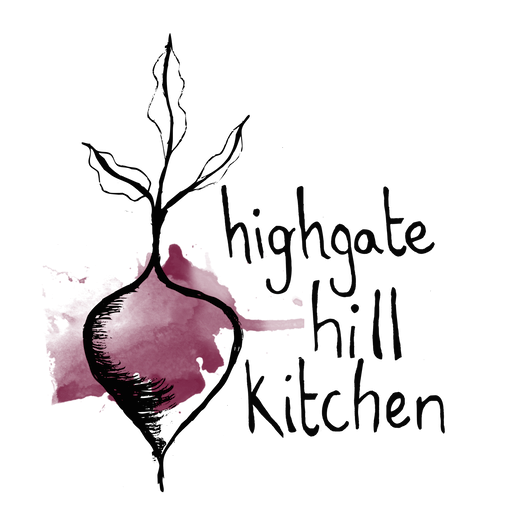 Once it is ready, add the cheese, butter and thyme leaves and stir until fully combined. 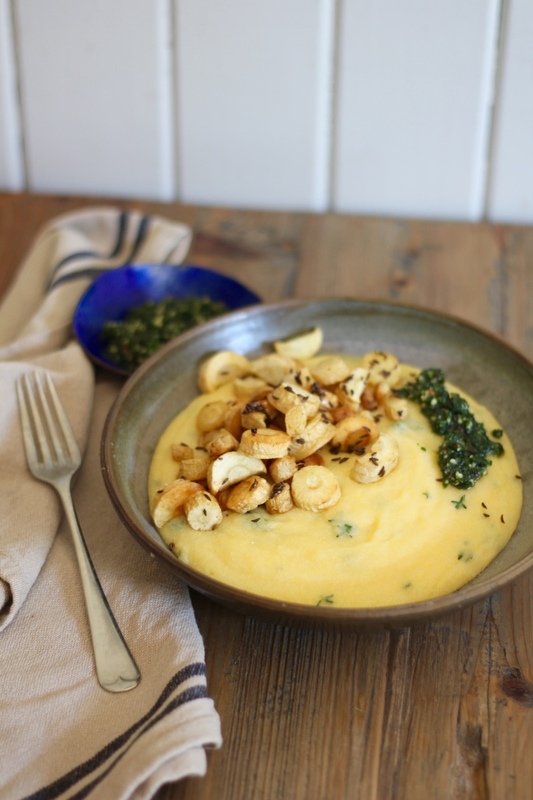 Divide the polenta between two bowls, top each bowl with the buttered roasted parsnips and generous spoonfuls of the pesto. Eat immediately. 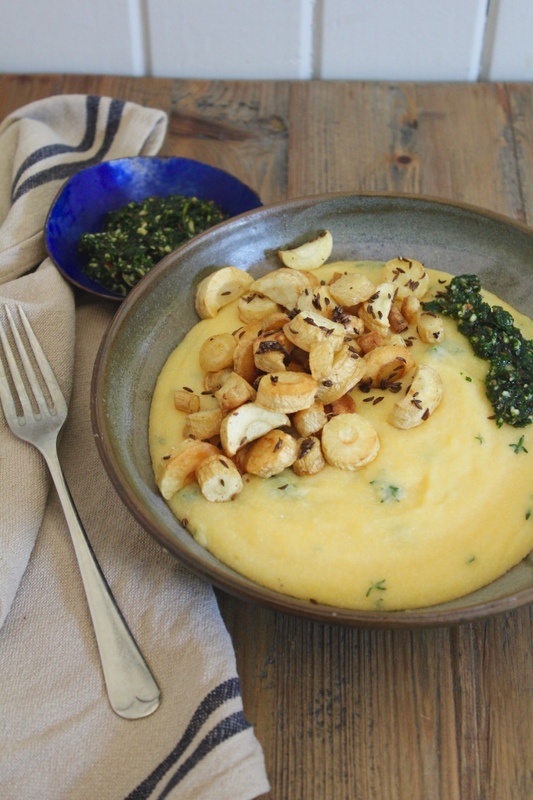 I rarely make polenta but the combination of roasted parsnip coins and pesto on the soft polenta sounds so good, especially with the colder days coming. And yes I like your table 😉 and that bowl! I love this bowl too! I got it from a young pottery artist at our local markets.